The rescue of the Florida Everglades, the largest and most expensive environmental restoration project on the planet, is faltering. Seven years into what was supposed to be a four-decade, $8 billion effort to reverse generations of destruction, federal financing has slowed to a trickle. Projects are already years behind schedule. Thousands of acres of wetlands and wildlife habitat continue to disappear, paved by developers or blasted by rock miners to feed the hungry construction industry. The idea that the federal government could summon the will and money to restore the subtle, sodden grandeur of the so-called River of Grass is disappearing, too. Instead of complaining about the federal government's stinginess, why not consider what more Florida can do now, if not to restore the entire ecosystem, to stop the development of a habitat and a hunk of land that most�Americans agree is worth protecting as a precious�piece of our national inheritance. M O N E Y Even though there is a glut of foreclosures in FL, and thousands of unsold homes, many are in the sub prime catagory, meaning you could never have afforded that 1200 sq foot palace next to the freeway onramp which borders N-word country. But find me a nice place with davits in my backyeard on a concrete bulkheaded canal or in an exotic location and bro I'm listening.. The snowbirds with money buy there. The snowbird pensioners buy in the marginal areas, near the bus line,and faltering mall. The Everglades won't survive, buy the DVD to show your kids. Too much M O N E Y to be made.....oh, and when you get below the Cape Canaveral parallel and you'd damn well better be able to speak Spanish to get by. So you guys believe everything you read in the New York Times. Please, I didn't know West Palm Beach was in the Everglades since a map will show you West Palm Beach is on the EAST coast of Florida and the Everglades is on the WEST coast. need to double check your map grant the everglades covers the entire southern tip of florida east coast to west coast. 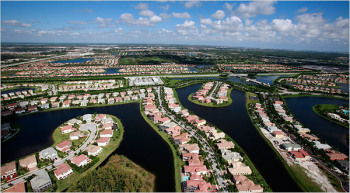 West Palm Beach is more up by Lake Okeechobee across the state from Ft. Myers. I rechecked my USGS wall map(4'by 5') of Florida I keep in my office. The part shown on the USGS mapping includes Miami. West Palm Beach is further north. Sorry about the caps I wasn't trying to shoot off my mouth just to show the difference. There have been greedy developers here since we shoved the Indians out in the 1840's. Of course they are in the process of buying it back by building casinos everywhere. Nearly 20% of western MT is owned by one company. Plum Creek used to be in the timber business, it recently announced it is really in the real estate business. The money in development is not in building houses, rather the money is in owning the contracts of sale--flipping the paper. Of course, these poor fools won't be able to keep up the payments--so, the paper goes back to the developer who resells at higher interest rate, while collecting on fees from the first owner. HABU take a look at a map of MT and see how/what Plum Creek owns and is intent on developing. in the box on top click in your county, then scroll down to land ownership and click on PDF. Everything that is very pale pink is plum Creek, and will be sold to developers. Lot of folks coming in to town from So. Cal and Fl, claiming to be "thoughtful developers", or "good developers".